The Buena Vista / Sir Wilfrid Laurier Park 10-year Master Plan was approved by City Council. The plan strives to increase people's opportunities to experience and enjoy the parks while preserving and enhancing the ecological systems in place. 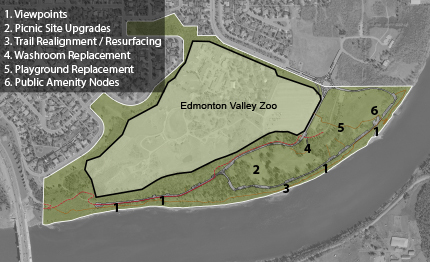 The plan expands opportunities to view and touch the water, introduces additional amenities, enhances existing facilities such as picnic sites, increases barrier-free design through the parks, identifies preservation areas and implements measures to protect and stabilize shoreline areas along the North Saskatchewan River. The master plan is being implemented in phases and will be completed by 2018. Small-scale viewpoints will be added at strategic locations along the riverside trail in the park. The nine bookable picnic sites within the park will be upgraded to include picnic shelters, concrete bases, new picnic tables and barbeque pits. The first come, first serve picnic sites will be upgraded with new landscaping, picnic tables and barbeque pits. The main gravel pathway that follows the river will be graded to remove low spots and a new gravel surface will be applied. In locations where the trail is being impacted by bank erosion, the trail will be redirected a safe distance away from the eroding bank. The serviced washroom facility is nearing the end of its life span and will be replaced. The new washroom will be comparable in size to the existing facility, however will be able to operate year-round. The existing playground equipment will be removed and replaced with natural playgrounds. These new playgrounds will feature natural materials such as logs and boulders which children can climb / jump / swing / play on. Public amenity nodes are planned near the washroom facility and the boat launch. These nodes will include a bench, waste receptacles, bicycle parking, and a park information kiosk. Approved by City Council on April 29, 2014. Learn more about the implementation projects happening within Buena Vista Park.